Use NearIT Platform to communicate when your mobile users are in proximity. Share with them valuable content in the most appropriate context to ensure the success of your mobile campaigns. You will need NearIT SDK, the platform interface and a mobile app. ...do you need an app? NearIT can be easily integrated into any iOS and Android app using our SDK documentation. NearIT’s SDK upgrades the features of your app and after a one time installation, marketers and other non-tech professionals can easily manage all mobile communication and mobile marketing campaigns on NearIT. For more information about the SDK integration procedure, take a look at our SDK integration guides. NearIT’s interface is intuitive and very user friendly. It assists you in planning your campaign step by step. Choose your RECIPE, the ingredients to define how you will interact with your users. 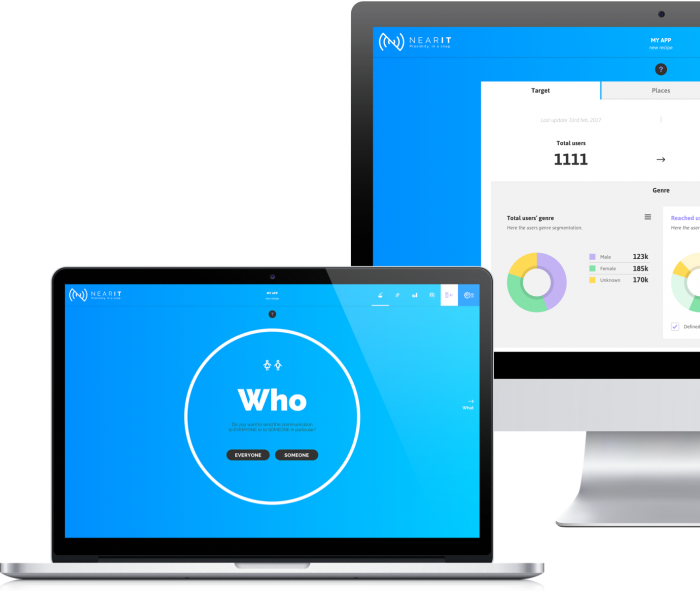 Defines who the targeted end users are by profiling them in detail using the data that users have shared in-app, their past behavior and the information already available in the app’s CRM database. Defines how to interact with the chosen target using typical mobile solutions such as notification, text or multimedia messages, coupons, feedback requests, or with customized solutions. Defines the context in which your proximity content will be delivered. The main contextual variables are geographical, temporal or behavioural events. find the best context for your campaigns to benefit your users and your business.